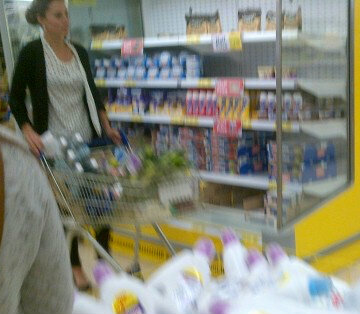 Duchess Kate was photographed shopping in her local Tesco in Holyhead, North Wales today by fellow shopper Amy Abitt (With thanks to Amy for sharing her photo via Twitter) Kate was stocking up on supplies with her shopping list in hand, for the couple's home in Anglesey, where William works as an RAF Search and Rescue pilot. The couple are expected to remain there until the Paralympics commence in just over a week. Amy described Kate as 'beautiful' in person. 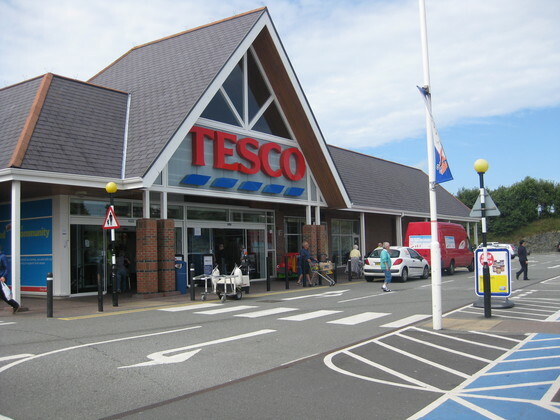 Kate's local Tesco store in Holyhead. The Duchess is regularly seen shopping there. Below we see Kate departing the store last August. Kate wore the polka dot Zara top she was last seen wearing visiting Team GB house at the Olympics with a black and white cardigan, skinny jeans and wedges. The 30 year old wore her hair scraped back into a bun and accessorized with silver earrings. Sigh, that would be my absolute dream to run into Kate shopping. What a nice unexpected surprise! I love to see Kate in her casual looks! Thanks for the photo, would have loved to have seen more. I wish I looked that gorgeous grocery shopping! Thank you Charlotte for this post. I was having Duchess withdrawals. She is just another house wife taking care of her Prince. I'm sure she's happy to be able to spend some quiet time with William. But moments like this routine shopping trip serve to highlight what she gave up in taking on a public role. People forget that at times, but I guess it's easier to see the perks than the reality behind it. Very well said. While being a royal must be wonderful it also presents so many challenges and must be such a change for someone who didn't grow up in the public eye. That's my favorite polka dotted top!! !She's so normal just like one of us!! How would you all like your every movement in your daily life photographed? It's people like you wanting more and more photos of Kate that will lead to a similar situation to the one that got Princess Diana killed in 1997. You make a comment like this and don't have the guts to sign your real name? And I disagree with you. We don't go out & get these photos they are taken by other people. This photo posted above was not even taken by the media, it was taken by someone shopping in the store. When the couple are in Wales the media leave them alone. Sorry if ive misunderstood your comment but the first photo on this blog is one Charlotte has taken from twitter so is automatically available to anybody worldwide anyway. I know what you mean that it must be awful to have someone photograph you every time you venture out of your house but I'm sure Kate was made very aware of this before she married into the royal family and this was to be expected. It was a person of Anglesey who took this photo. Not the media. 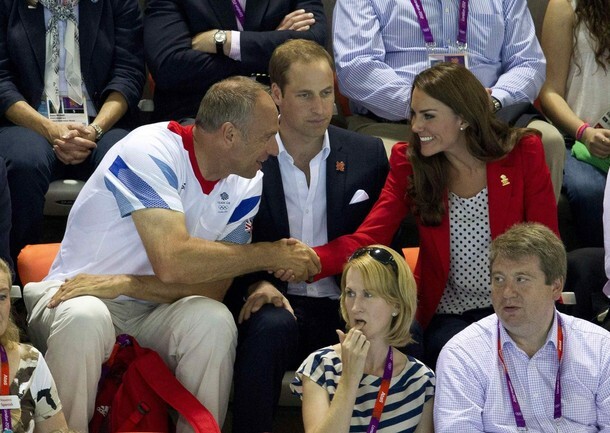 It makes no difference who took the photo, it is still an invasion of Kate's privacy in her personal private time. It's because of such a demand for more and more photos of Diana that she was hounded to death every time she set foot outside her home at Kensington Palace. Culminating in the end on August August 31st 1997 with the paparazzi chase that ended her life. Kudos to Kate for just getting on with it. She understands what she married into, and the pros/cons that come with it. No fussing, no complaints to the media, just classy. Once she's Princess of Wales or Queen Consort, she really won't be able to do stuff like this anymore. I mean, she could, but it would require several dozen bodyguards. I wonder, how many bodyguards were with her on this trip? Did Amy mention if any were present? I believe there is always two bodyguards with the Duchess at all times when she is out shopping. No you only publish comments from soppy Kate admirers like yourself! What the hell does your comment mean??? Sorry but I have to disagree! If you look back over the posts for this blog Charlotte does post comments which create a debate amongst the readers not just those that are biased towards Kate or ones with opinions she shares. I get the impression that you are not Kate's biggest fan and, if this is the case, why visit a blog which is dedicated to her? I publish all comments unless they I feel they are trolling or hateful. All the regular readers can attest to that. I think Kate is very aware of the situation she finds herself in now - it's a tricky one as the Royal Family are enjoying a period of great popularity at the moment and technology has moved so fast that with Twitter and camera phones etc. they are likely to be snapped and posted faster than we can blink! I'm afraid it's part of society these days - I personally think the Honeymoon shots are unfair game, especially after an estimated 2 billion people watching your wedding (I can't imagine how that must be having heads of state and politicians etc. when it's such a personal thing!). However, I thought that if you are out in public all of us can be snapped and that's the UK law? I may be wrong. I think there's no harm in sharing with fans but I do worry about where all this technology etc. will lead and fear that it does infringe on privacy a little too much at times. I've just finished reading The Bodyguards Story by Trevor Rees-Jones and think that the wider press and our Royals have reached an agreement that, for the moment, seems to work. I still miss Diana every day and wouldn't wish the last days of her too short life on anyone. I also have a suggestion for a 'Kate loves' post: in case you write about casual wear (which would be lovely!) I would add the uggs - she has at least three pairs, she wore them sometimes before the married William. She has beige, brown and green uggs. when this photo was taken, if anyone knows? It was taken at a private military event, I'm not sure of the date but I at least a number of months ago. I can´t remember this event. She is wearing the same dress and jacket, she wore when she left UK for the Canadian and American tour in 2011. But i honestly have no ideia of such another ocasion she wore the same exact outfit (despiste bag and shoes). Random question/comment: In previous shopping pictures, it seems she always leaves the grocery store with plastic bags. Are reusable cloth bags not as popular in England as they are in the US? Full disclosure: I mean the West Coast of the US. Could the cardigan be the one she wore at a Wimbledon match in 2008?